reading | my heart is happiest when i travel. read. write. connect. I’m a reader. Always have been, always will be. But just like anything, there are heavy seasons and there are light. I’m in a heavy season at the moment, devouring books quickly, picking up a new one as soon as (or before!) I finish the old one. Since January 1st, I’ve read 10 books. Since this week is Literacy Week (My favorite week of the school year! More on that next week. ), I figured I’d write about reading. I learned a unique strategy for a reader’s notebook entry from a colleague a while ago. It’s called “The Last Ten Books I’ve Read and What They Say About Me as a Reader.” Here we go. This book was given to me by Michelle. Michelle and I always recommend books to one another, and any time I go home to visit, she always has a book or two to pass on to me. I really enjoyed this one due to the author’s voice; I loved the honest and quirky comments from Eleanor. Since realistic fiction is one of my go-to genres, this one fit in my wheelhouse. This book will be made into a movie soon, so I had to read it, as the book has to be read before watching the film. I would recommend this book to anyone who likes an unconventional love story. Working in an international school has opened my eyes to many cultures and broadened my views of how children from different cultures interact with one another. I ordered this book from Amazon since I thought students at my school would connect to it, as it explored an Indian child’s start at a school in America. I enjoy reading Young Adult literature so that I can keep current with what students are into, plus it’s easier to recommend books to students if I’ve read them. This book was a quick read; I liked the short chapters that alternated between the two boys’ perspectives. I would recommend this for students in fourth to sixth grade and upper primary teachers. Okay, can I just start by saying…I LOVE THIS BOOK! This one is another recommendation from a friend. Over the Christmas holiday, Shags texted me to tell me she was in the middle of a book that she just knew I would love. And boy, was she right! I picked up a copy at Half Price Books, but since I was reading another book, I had to wait a bit to start it. I began this book on the plane ride to Bangkok, where I attended a job fair for 4 days. Despite my busy schedule, I found time for reading. I couldn’t put it down, and finished it by the end of the trip. I love a good coming of age story, and if you do too, you will love this book. I also enjoyed the way the story was told through a mix of narrative and emails. Three Young Adult books in a row…I’m sensing a pattern. But I just can’t resist! And this one has won so many awards that I had to give it a go. I enjoyed the unique storytelling style, told through poetry. The intense topics addressed in the book are made more intense by the word choice, line breaks, and lack of text. As I read this book, I made many connections to The Hate U Give, a book I read a couple of months prior. If you liked THUG, you’ll enjoy this one. This is one I listened to rather than read, and I’m so glad I did! Hearing the author read her own memoir is so much better than reading it on my own. You get so much more from the tone of voice, inflection, and pacing than simply reading the words. On Audible this book is 19 hours, so it took me a few weeks of listening as I got ready for school in the morning, on my morning commute, and before I fell asleep. Memoir is another favorite genre. I think memoir speaks to my soul since I value storytelling so much. I enjoy hearing a person’s story, seeing how experiences in their life have shaped who they are. And Michelle Obama is someone who has done so much for women and girls in America. I would highly recommend this book, especially the audiobook. This one ticks a few boxes. Realistic fiction (well…sorta realistic)/mystery, it’s soon to be a movie, and it’s told in a unique way, through a mix of emails, texts, letters, documents, and narrative. Once I picked this one up, I couldn’t put it down. I just had to know what happened to Bernadette! This one is now our Book Club book, thanks to my recommendation. I hope my friends like it as much as I did. Something I struggle with is getting everything done on my to-do list. Spoiler alert- I never do! When I start working on a project, I can fly through it if I’m super into it, but if it’s something I’m not interested in, I can procrastinate and dread even starting it. I picked up this book to hopefully get some helpful tips for overcoming this issue. While some of the tips were things I already knew (and don’t do), many of them were new ideas to me and ones that I hope to put into practice soon. If you struggle with procrastination, I’d recommend reading this book. I know what you’re thinking already. She totally jumped on the Marie Kondo bandwagon. Yeah, I admit it; I did. Michelle and Linner both recommended this book to me ages ago, so I downloaded it on Audible. I started it, but could never get into it. To be honest, I think it has more to do with the narrator than the content; she nearly put me to sleep anytime I listened. After a few failed attempts, I abandoned it. But after watching the Netflix series, Tidying Up with Marie Kondo, I tried out some of her lessons in my own house. I found that it made a big difference, so I gave the book another try. While I appreciate her methods and many of her tips, some of it is hokey to me. I don’t think I learned much more listening to the book than I did watching the show so I wouldn’t really recommend this book; just watch the series instead! Yep, another Young Adult/Teen book. But in all fairness, I didn’t know it when I bought the book. I actually bought this one based on the cover. Once I started reading it, I fell in love with Finch and Violet, with their imperfect and complicated lives. It deals with heavy issues, such as suicide, so if you are looking for a light read, this isn’t it. But I really loved it, despite the heaviness. After Milk and Honey, I was convinced that all Rupi Kaur’s other books would be a letdown. There’s no way she can write another book of poems as beautiful, I thought. Well, she proved me wrong! The Sun and her Flowers spoke to my soul in ways I didn’t know was possible. It’s definitely a book I’ll reread again and again. The passion, vulnerability, and honesty in her poems hits you in the face. If all poetry was like this, I’d read a lot more of it. I highly recommend it to anyone who appreciates good poetry that deals with real issues. In addition to the books I’ve completed this year, I’m also in the middle of a few others- The Power of Inquiry by Kath Murdoch, Culture Map by Erin Meyer, and How to be a Travel Writer by Lonely Planet. If you have any must-reads, please leave them in the comments. 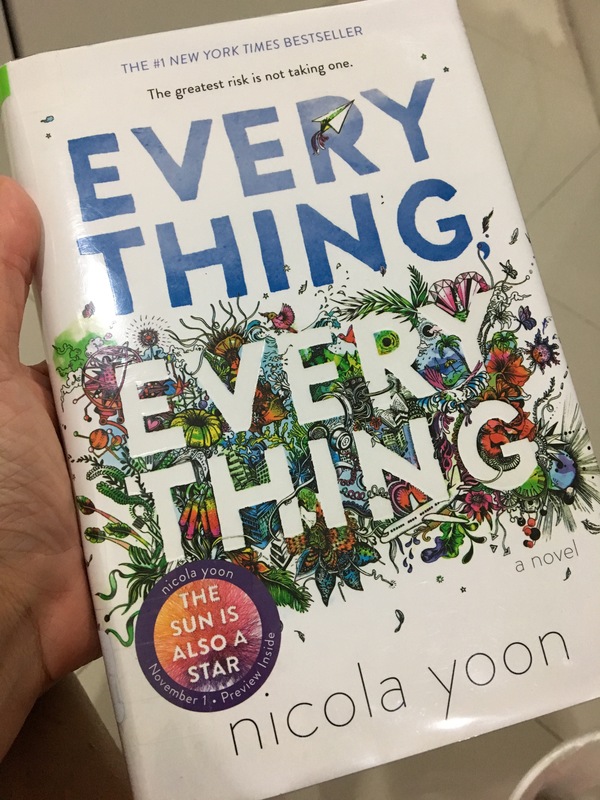 This entry was posted in Slice of Life and tagged books, reading, reflection, Slice of Life, Slice of Life Challenge on February 12, 2019 by aggiekesler.